A man looks at local newspapers on a street in Accra, Ghana, Dec. 9, 2016. Incumbent President John Mahama conceded defeat Friday evening and telephoned congratulations to the victor, Nana Akufo-Addo. Longtime Ghanaian opposition leader Nana Akufo-Addo has won the presidency on his third attampt, defeating incumbent President John Mahama. Mahama conceded defeat Friday evening and telephoned congratulations to Akufo-Addo. Mahama acted just before the electoral commission officially announced Akufo-Addo as the winner of the election, with 53.85 percent of the vote, compared with 44.4 percent for Mahama. Calls had been mounting on social media for the electoral commission to speed up its vote count following Wednesday's election. Speaking to supporters earlier Friday at his residence in the capital, Accra, Mahama appealed for calm and said he would accept the final results. Akufo-Addo, who leads the opposition New Patriotic Party, or NPP, and the police also asked the public to remain patient while the electoral commission did its work. 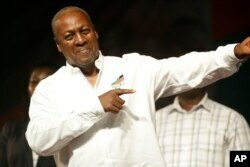 Mahama was seeking a second term as Ghana's leader. The West African country is a major exporter of oil, gold and cocoa. Ghana Incumbent President, John Dramani Mahama candidate of the National Democratic Congress gestures to his supporters during a presidential election rally at Accra Sports Stadium in Accra, Ghana, Dec. 5, 2016. Akufo-Addo used Ghana's current economic woes as a main theme of his campaign, accusing Mahama and the National Democratic Congress, or NDC, of incompetence. The new president has served as both foreign minister and attorney general in a previous NPP government, but twice narrowly lost earlier battles for the presidency. 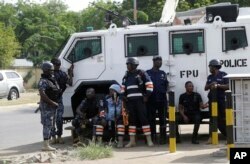 Police stand guard at the entrance of the Ghana electoral commission office in Accra, Ghana, Dec. 9, 2016. Mahama's term was overshadowed by the plunge in global oil prices, which reduced government revenues and contributed to soaring inflation. The government accepted a $918 million bailout from the International Monetary Fund. Ghana is considered one of the most stable democracies in Africa, having witnessed several peaceful transfers of power since 1992.